On Tuesday, March 5th, some students form the FHS Beta Club traveled to Cabell Huntington Hospital to spend time with pediatric patients for the evening. Most of their time was spent playing games with the children to put a smile on their faces. The kids and Beta members had a great time! Fairland High School Beta Club is proud to say they raised $937.00 in the strawberry fundraiser! The money raised will go towards graduation chords and the Christmas shopping trip next year. Hopefully our next fundraiser will be just as successful as this one! Herff Jones is coming on March 13th to give everyone their graduation materials, except for caps and gowns! Make sure to pick up what you paid for. As we are rounding out another year with our graduating Seniors, we have a few announcements to make. All seniors should submit a baby picture and kindergarten picture to Kelsie Warnock or Mrs. Sansom by March 15th. Also, if you are a senior and want to request slide show songs, please send that to Kelsie. Seniors can also reccomend flowers or song suggestions to Olivia Roberts or a student council member. One last announcement, check your email for any scholarship opitons that may have been recieved. The class of 2023 students who have been accepted to Marshall University can participate in Green and White Day. It will be held on Monday, February 18th, 2019. A reception and campus tour will be held for students. All future Marshall students from the area should attend! Hope to see you there! Senior Salute was announced this past week, honoring students that have gone above and beyond in their high school career. The winners were Katrina Abbott, Maddi Flynn, Tori Hall, Makenzie Kazee, Allie Marshall, Wyatt Morris, Mckenna Pannell, Olivia Roberts, Kelsie Warnock, and Alice Zhang. The ceremony will be held on March 13th at 6:30 p.m. at Ohio University Proctorville Center. All Seniors received a Senior Salute paper November 19th. The form needs to be filled out and returned to Mrs. Marshall by December 20th, if you would like to participate. Update: For any senior that did not get their picture taken for the yearbook, retakes will be held Wednesday, December 12th from 1-4 p.m. The Quiz Bowl team has recently finished their regular season for this school year. On Wednesday, March 13th, the team will be facing Iron Masters for the tournament. The team is preparing to do great! Everyone is cheering them on as they face their opponent! We all wish them the best of luck! The FHS Quizbowl team ended their regular season this week. The JV team ended with a record of 5-2 and the Varsity ended with 3-4. The Varsity team will participate in the Ironmaster tournament March 12th. The Quizbowl team played January 8th at Ironton against Ironton St. Joseph and sadly lost by 5 points in the Lightning Round. Quizbowl is a intense trivia competition between club members of the competing schools. The Quizbowl team, sponsored by Mr. Hall, battled against Chesapeake High School on November 11, 2018. Unfortunatelty, varsity ended up losing after a vigorous fight: 45-29. On a postivie note, JV won 51-38. Questions involved topics of Science, American Literature, World Studies, Geography, American History, and Pop Culture. Each match consists of three rounds: team, lighting, and alphabet. We wish the dragons the best of luck at their next match! Update: The FHS Quiz Bowl team won their first match on December 4th. They defeated Symmes Valley with a score of 51-36. They are now 1-1. The JV team remains undefeated after beating the Symmes Valley JV. Great job, Quiz Bowl! On Friday, The FHS Freshmen are going to Career Day! Career Day will take place in Ironton and all freshmen will have the opportunity to attend! This is a great way to plan for them to plan for the future! AP Biology and Anatomy classes! On Thursday, March 7th, Mr. Hayes' AP Biology and Anatomy classes will be watching an autopsy! This video will take place in room 153 from 1:30 p.m. to 3:00 p.m! Last Thursday, the Fairland Dragons Special Olympics basketball team competed against other OVC schools. The Dragons brought home the first place trophy while going undefeated all day! A player on the team told us that they executed "good team work" to win. The player also said that when the team won the championship they were so excited! This past weekend, there was a Christian event in Gatlinburg, Tennessee. Over 13,000 people attended, including members from Rome Church of Christ of Proctorville. This is an annual event and grows every year. On Monday, January 28th, Fairland's own student athlete, Emily Browning, signed to play soccer at Kentucky Christian University. Many of Emily's teammates, friends, and family supported her decision. She has decided to also major in nursing during her time at KCU. Everyone is excited for her decision and wish her the best of luck! This past Friday's pep assembly was one for the books! With the teachers competing and having a blast, the students cheered and enjoyed the show! Speaking on behalf of most of the student body, the History and Science Teachers both know how to put on a show! This just might be the best pep rally we have ever had! Sponsored by the Tim Tebow Foundation, Night to Shine is a prom night experience for people with special needs. The dance was held on February 8th, 2019. Many students from FHS gladly attended and volunteered to be dates! The students enjoyed their night full of karaoke, great food, and lots of dancing! Update: Yearbook sales for the 2018-19 school year are available. If you are looking to purchase a yearbook, you can do so before school or during lunch of Tuesdays and Thursdays. The FHS yearbook is coming together and is on track to be ready soon. This year's yearbook features pictures of students from all grades, sports, clubs, and after school activities. Be ready to buy a 2018-2019 yearbook, it's going to be a good one! Valentine's Day is coming up on the 14th, and the students of FHS are starting to sell candy grams! The students sell these every year to get in the Valentine's Day spirit! Only costing a dollar, the students can purchase them during first and second lunch, and also before school. Some of the items include skittles, chocolate, and even goldfish! Everyone can give an anonymous candy gram to their special someone or friends! The FHS Student Council and the Red Cross will be hosting a blood drive on Tuesday, February 12th, in the high school gym. Students and community members 16 years and over are eligible to donate. To donate, you must bring your ID. If you are giving blood, drink plenty of water in the days leading up to the drive and eat a good breakfast the day of. We hope you will donate to this important cause! Post-Secondary Enrollment Options program (PSEO or College Options) and College Achievement Program (dual enrollment). If you are interested in learning more about this opportunity, we will be hosting a College Credit Plus meeting at Fairland High School in Room 153 on Wednesday, January 30, 2019 at 6:00pm. At this meeting we will discuss important topics such as program eligibility, guidelines, important dates, academic and social responsibilities of the student, and potential risks and benefits of the program. In order to participate in the CCP program for the 2019-2020 school year, students in grades9, 10, 11 and their parent/guardians are highly encouraged to attend the meeting. In addition, a “Letter of Intent” to participate in CCP must be signed and returned to Mrs. Marshall by April 1, 2019. See Mrs. Marshall for a copy of the “Letter of Intent”. We will also post information about the program and helpful links on our website at www.fairland.k12.oh.us. If you have any further questions, please contact Mrs. Marshall. FHS students are preparing for Science Fair, held on Friday, January 25th! As the participants are trying to pull everything together, the word is that everyone is hoping for a "snow day". We will be welcoming people all around the community to judge the projects. Everyone wishes the students the best of luck! On Wednesday, January 23rd, five Student Council members will attend a Leadership Conference. Zoie Weinsweig, Alex Rodgers, Connor Sansom, Katie Flemming, and Isabella Gariddo will be traveling to Shawnee State to participate in this conference. They will spend the day engaging in activities that will help them in their leadership positions. We are thrilled about this amazing opportunity. Monday marked the start of the new semester and beginning of the third nine-weeks! Students will be switching out of their semester classes and into their new ones. If students wish to switch their classes, the sign-up sheet is on the office window; Mrs. Marshall will call names down. However, some classes may be full, so some students may remain in the same classes. Mr. Shew, the conductor of Varsity Vocals, will hold try-outs at Fairland High School (tryout date TBA). 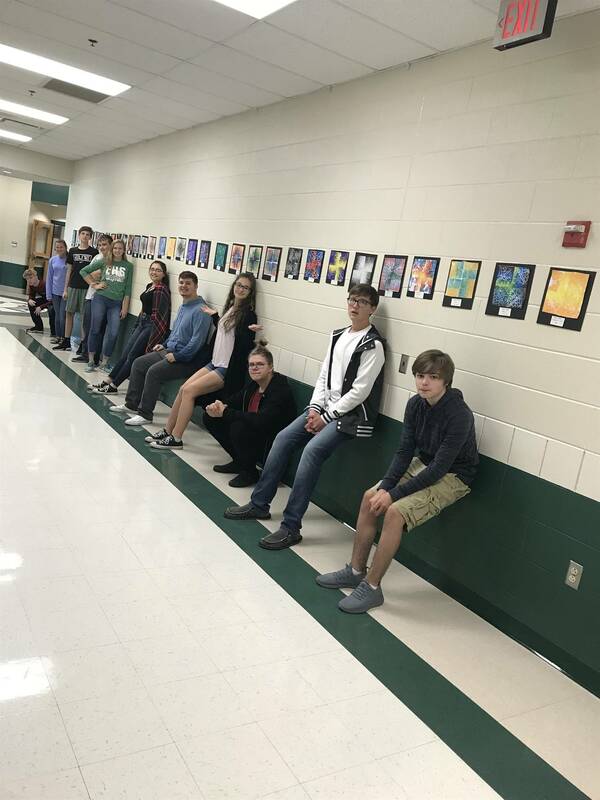 These students can be upcoming Freshman for the 2019-2020 school year or students already attending FHS. The current class is eager to witness the new talent at FHS and we encourage you to come try-out! Friday November the 9th, Varsity Vocals, conducted by Mr. Shew, will be performing at the Middle School for their annual Veteran's Day breakfast. The singing group will perform several patriotic songs to honor those who serve and have served for our country. Update: On Saturday the 15th, Fairland High's Varsity vocals will be performing at Finley Baptist Church at 6:00 p.m. They are singing Christmas songs and getting the community into the Christmas spirit! Also, the group is having their annual choir concert Saturday the 16th at 2:00 at FHS! Please come out and support our musical performance! The Huntington City Hall will be hosting a Christmas dance performance this Sunday, December 9th at 2 p.m. A few of our Fairland students will be performing including Gabby Bellville, Olivia Roberts, Zoie Weinsweig, Audree Rose Watkins, and Isabella Burcham. All proceeds will go towards the Hospice House of Huntington. We hope to see you there! This past weekend, the FHS Cheerleaders traveled to Cleveland, Ohio. They left the night before, and had an eventful Saturday. First, they had practice with multiple other teams and worked on their dance at Cleveland State University. Next, they performed that night at the Cleveland Cavaliers basketball game. They did very good, and we are super proud of them! Select students out of the band will be going to Ohio University's Honor Band December 6, 7, and 8th. Once they arrive, they will practice all day Friday and Saturday. On Sunday, they will perform at 4:00 p.m. in the Templeton/ Blackburn auditorium. We are extremely proud of them! Each grade is competing against eachother until Tuesday the 20th for a chance to win a free period. Teachers give challenges to each grade so that they have they opportunity to win feathers to put on their turkey. Some of the challenges are attendence, wearing green and white on Fridays, and bringing in coins for Beta Club. At the end of the challenge, the team with the most feathers wins! Update: After a long streak held by the Seniors in the lead to win a free period, the sophomores pulled out the win! With a last minute flow of cash, the sophomores bagged the most poundage in change and won the competition. Congrats sophomores! Math Club is putting on a fundraiser to raise money for graduation chords. If you are interested in purchasing some new Fairland gear, see one of the Math Club members. Be sure to order something to help out your Math Club Seniors get their chords! The Prom Committee is selling cupcakes until Tuesday, December 4th. There are four different kinds, and each are $10 per 1/2 dozen. They will be delivered on the 18th of December. Many countries celebrate the holiday of Thanksgiving, including the U.S.A. The traditional thanksgiving foods in the United States include: turkey, stuffing, mashed potatoes, corn, and Texas Roadhouse rolls! Yet, not everyone has a traditional Thanksgiving meal. For example, Ramen noodles, pumpkin pie popcicles, bacon, an last but not least, turkey and cranberry cupcakes are nontraditional Thanksgiving foods. Yummy! Of course, some fun Thanksgiving traditions include getting together with your family and eating. Another fun thing to do is sit at home and enjoy the Macy's Thanksgiving Day Parade. Another traditon people have in the United States is traveling to see family and friends to celebrate the day of Thanksgiving. The Fairland High School Marching Band participated in the Huntington Veterans Day Parade. To honor our veterans, the band played different melodies form the armed forces. The school and community are proud of what the band has accomplished and continues to do. The American Red Cross is facing a severe blood shortage. The organization currently needs both negative and positive type O blood. Donations are being held November 21-24 for a free tshirt, and November 24- 19 December for a $5 Amazon gift card. Please come donate and bring a friend! Help patients that desperately need blood donations, especialy during he holidays! YOur donation cna help save a life! McKenna Pannell Goes to State! The Thursday after qualifying for the State Cross Country Meet, Mckenna Pannell traveled to Hebron, Ohio, and stayed overnight that Saturday. While she was there, she ran the the course to prepare for her race later that week. On Saturday November 10th, Mckenna competed in the Division II State Meet, which took place at the National Trails Raceway. Despite the muddy course and frigid weather, she still ran well and placed 55th overall in her race. Her coach and the Fairland community are very proud of her and her accomplishments. Fairland HIgh School competed in the Special Olympics this past week at Chesapeake High School. The teams competed in tournament games of volleyball, and Fairland students brought home the win! Congratulations to the athetes that competed! FHS's Musical: "All Shook Up"
Congratulations to Sebastian Davies for winning the local Voice of Democracy. 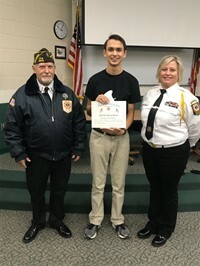 His speech will be forwarded to the National VFW for competition! The Special Olympics is a widely known sports organization involving adults and children with disabilities who compete in competitions all around the world. Some students at Fairland are looking forward to the Fairland Volleyball game coming up soon. All children enjoy attending and playing against other schools. it allows everyone to have fun! There are many scholarships available to our seniors. Some include: The Coca-Cola Scholarship, Prudential Spirit of Community Award, Elk National Foundation, Foundation for Appalachian Ohio, Voice of Democracy 2018-2019, and the National Beta Scholarship Program. Please see Mrs. Marshall or check her website for more information. Last week, our school hosted it's annual spirit week. During that week, the football team hosted a powder puff game on Thursday. The teams were green versus white. Green was led by Joel Lambiotte and white was led by Reilly Sowards. After 4 long quarters, green walked out victorious with a score of 28-24. Nina Miller, on the white team, had a spectacular game. But Allie Marshall caught the game winning catch with 12 seconds left. The best part was that she caught the ball on her little sister, Emma. Next week, starting Monday the 5th and continuing Tuesday the 6th, the Senior class will be taking Senior pictures. On Monday, pictures will be from 11-5 and Tuesday, 9-2 p.m. Seniors- don't forget to come and get your pictures taken! This week, the Spanish 3 classes at FHS went to watch Spanish dancing in Charleston. The show featured music and dancing from various parts of the world. Students could also volunteer to go onstage and perform with cast members of the show. Spanish 3 students mentioned they had a great time and they learned more about the Spanish culture. Fairland High School's Beta Club will be selling Scraggle Pop this week. The students are trying to raise money for the Beta Club's Christmas Shopping trip. The money for Scraggle Pop will be due Thursday, November 1st. Also, Prom Committee is selling Yankee Candles to raise money for their decorations. This money will be collected Monday, November 5th. FHS's 2018-19 Quizbowl season is getting ready to start up with a match of November 14th at Chesapeake. This year's team is led by Seniors Scotty Ferrell, Alice Zhang, Matt Mondlak, Samir Atai, Kaleigh Rummel, Katrina Abbott, Adrianna Clagg,and Carson Bailey. The Juniors this year Colin Mckinley, Taylor Webb, and Addi Speed. Sophomores include Anthony Zhu, Jacob Polycn, Max Ward, Abbe Kiritsy, and Emily Sharp. This year's Freshman are Zoie Weinsweig, Alex Rogers, and Kylie Hayes. We wish them good luck on a successful season! Dawson Bryant High School hosted a College Fair for the 2018-19 Seniors, and FHS Seniors were offered the chance to attend. There were 43 colleges present during the fair. Students recieved information for the booths of their choice and got the chance to speak with college representatives. Fairland High School is putting on a musical called All Shook Up. Tryouts for this musical will be held Monday, October 29th in the cafeteria. Mr. Shew, the music teacher and head of the choir, is the director. The songs in the musical are based off of the works of Elvis Presley and there are multiple roles to try out for. The FHS Student Council has been very busy putting on many events such as hat day last week, in addition to helping the Seniors collect gloves, hats, and scarves for their October Senior project. The Student Council will also be hosting a Powder Puff Football game on the 25th at 6:30 p.m.
On Friday,October 19th, Fairland High is holding a Hat Day! During this event, students are permitted to wear a hat for the whole day with a payment of $1. Students have to pay before 1st period and will receive a sticker that they must keep on to participate. The money collected will go towards the beautification project this school year. Prom Committee is selling Yankee Candles!! All proceeds will go to make 2019 Prom a great night! Want to order? See a Prom Committee Member or Mrs. Sansom to order! Hanna Shrout goes to State! Update: Hanna Shrout competed in the State golf tournament this past weekend. She traveled to Ohio State University to play at their home course. It was a two day tournament, and she placed 8th. Before Hanna and boys' state nominee, Clayton Thomas left for the state tournament, the golf team threw them a party. Great job, Dragons! Hanna Shrout is a second time State OHSAA Golf Tournament qualifier. She has played golf since middle school and has worked hard for the Fairland Golf program. Hanna is dedicated to golf and practices constantly to improve her game. One of her biggest supporters happens to be her current golf coach, Bryan Ward. He has helped her make it to where she is today. Congradulations, Hanna! Fairland High School elected their 2018 Homecoming Court! The court members will participate in several activities including the Huntington Fire Parade, Proctorville Parade, and Rome Parade. FHS has recently became involved with the Big Brothers and Big Sisters of America. The organization is currently trying to find students in high school who could be possible mentors to "littles". Juniors and seniors that are interested can sign up in the office. A future meeting for possible applicants will be announced soon. Join us October 25th for the FHS Powder-Puff Game! This year, the ladies from every grade will go head-to-head for a chance to help out the FHS Beta Club's Christmas Shopping Trip. All proceeds will go towards the trip, which is always a great way to help underprivilaged kids. This event isn't all about the ladies. High School boys get the chance to cheer on the girls as their personal cheerleaders! Make sure you don't miss the opportunity to have some fun and help out the FHS Beta Club. Clayton Thomas goes to State! Clayton Thomas, a Sophomore at FHS, is a student athlete and a member of the Golf Team. Clayton has had an outstanding season and will continue to show his skills on October 12th at the Ohio State Golf Tournament. Clayton is the 2nd member of the Men's Golf Team in FHS history to make it to the state tournament. Students at Fairland are proud to have Clayton to represent them and will be cheering him on this Friday! Friday: Green & White! Rock out your Fairland Dragons Gear!! The Student Council hopes everyone finds a way to participate this week! Let's have fun and beat the Peake! The Fairland High School STudent Council once again sponsored the Homecoming Games Competition. On Monday, the grades competed in Cage Volleyball, with the Seniors winning the day. Chicken on a Hen House was the game for Tuesday - with the Sophomores earning extra points for having 2 teams in the final round! Wednesday saw the grades competing in the annual Bring Me competition. Although the Freshmen did have the plunger (who knew? ), the Seniors took home the victory! On Thursday, the Juniors took the day playing Hungry Hippo. Dodge Ball was a wild and crazy on Friday - with the Freshman finally taking home a victory! After all the points were tallied, the Seniors pulled out the close victory (final score of 20-16) over the Sophomores. It was a great week - with lots of fun! Now we're looking forward to Spirit Week! Bring on the Peake! Students at FHS would like to welcome Mr. McClellan to the district, as their new assistant principal. His wife, Mrs. McClellan is also a teacher at Fairland. He has two children that attend Fairland West. He is also a fan of the Cincinnatti Reds and enjoys watching football in his spare time. Congratulations to the FHS Band, Majorettes, and Auxilliary! The band placed FIRST in each cagetory at this weekend's Apple Festival! Way to go Dragons!! On September 18, 2018, the seniors met with Herff Jones to discuss graduation. The company gave the students packets to order all the graduation needs, such as caps and gowns, invitations, senior attire, jewelry, and much more. Package deals including these are available, but to recieve one, students must pay $100 down by October 3rd. Payment on caps and gowns will be available until March 1st; however, seniors should order and pay before January 1st to avoid a late fee. Robert Cook, one of the biggest Fairland supporters, passed away early Sunday morning. Mr. Cook was the first guidance counselor and the first Middle School football coach for Fairland. He loved this school and showed his face at every event possible; people could go on and on about Mr.Cook's passion and love for anything Fairland related. Even those not familiar with him noticed how much he wanted Fairland to win. But Mr.Cook wasn't just in love with the wins, he loved Fairland's process. I have never met someone who wanted to watch Fairland practice on their own free will. Almost everyday we could look over and see him sitting on his front porch watching our football practice. Rain or shine, I talked to Mr.Cook everyday at track practice. He made sure to be there and support. He was a blessing to our community, and we are forever indebted to him. The Fairland High School Student council will be hosting a blood drive on September 12th in the gym. The Red Cross requires donors to be 16 years old to donate, a a valid ID must be on hand on the date of the blood drive. If you plan to donate, see Mrs. Sansom for a permission slip. You must also sign up in the office before you are able to participate. Be sure to drink plenty of water three days prior, and if you play sports, please check with coaching staff before donating. Update: This was FHS's most productive blood dirve in many years! Thirty-six units were collected!! This is exciting becaused if Fairland High School reaches its fall and spring goals, the Red Cross will reward one FHS senior with a $250.00 scholarship! Now, we are over halfway there! Homecoming is a week away for Fairland High! Homecoming tickets went on sale Monday, September 24th and will continue on through Tuesday, October 2nd. This year's Homecoming theme is haunted ans student are very excited for this spooky season! On Friday the 16th, Varsity Vocals is leaving to sing in South Point, our neighboring community. They are performing Christmas songs including "Mary Did You KNow" and "JIngle Bells". The group is excited to sing for the community! fairland HIgh is honored to have such outstanding and musically talented group of students.